Comic John Mulaney joked about University student life, including the registration system ISIS. 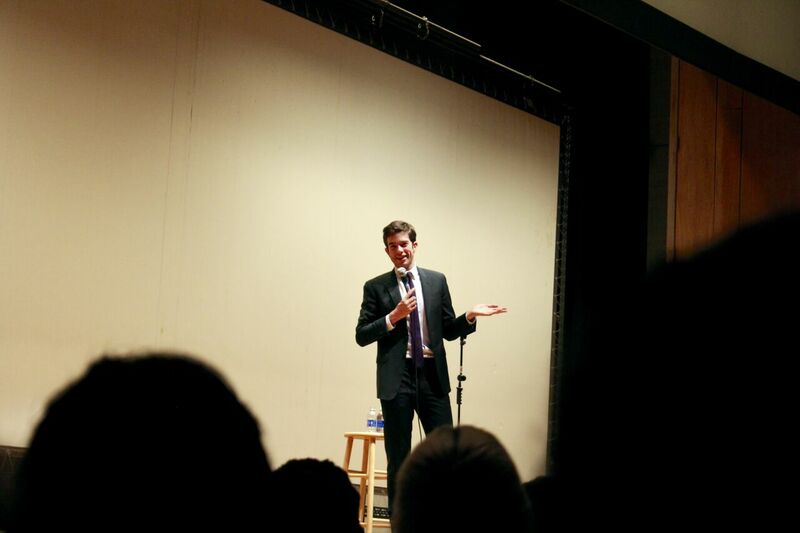 Comedian and former Saturday Night Live (SNL) writer John Mulaney charmed a packed Shriver Hall on Nov. 5 by poking fun at Hopkins culture. Mulaney, who was invited to campus by The Hopkins Organization for Programming (HOP), admitted he was suffering from jet lag, having just gotten back from a trip to Abu Dhabi where he visited American troops with Michelle Obama and Conan O’Brien. He did not want to leave to see Hopkins, at least not until his manager told him Hopkins is a top-ten school. The crowd whooped in approval. Throughout his set Mulaney proved he did his research, remembering the “s” at the end of Johns and skewering the school for not renaming the “ISIS” Integrated Student Information System. He cited American laziness and stubbornness as the reasons the school has kept the name. His Hopkins knowledge elevated his jokes from random, funny situations to relatable inside jokes. When an audience member decided to yell out the University of Alabama’s slogan, “roll tide,” during Mulaney’s conversation with another audience member, he jokingly critiqued him. “I’ve got a loud voice! I play lacrosse — I’ve got a loud voice. I ride around on a hoverthing,” Mulaney said, referring to the infamous motor scooters that many male lacrosse players ride around campus. About 30 minutes into Mulaney’s performance, three students came in late. His interactions with the audience were genuinely funny because they were spontaneous. John Mulaney’s second Netflix special will be released on Friday. A surprising aspect of Mulaney’s performance was that he talked about topics with which many college students have no experience, like marriage, children and buying a house, yet the way he told these stories made them engaging and laughable. One memorable anecdote about buying a house was relatable not because of the 30-year mortgage but rather because Mulaney touched upon common college-student feelings about the distant future and current pop culture references. “I bought a house. I don’t know why I bought a house. It was built in the 1920s but it was flipped in 2015 which means it is haunted but has a lovely kitchenette. I mean, I didn’t buy the house — a bank bought the house and I pay it off over 30 years, but I keep my pants there,” Mulaney said. Mulaney often circled back to hilarious anecdotes about his father. In his first story about his dad, he joked that he and his father had the mutual understanding of a cop and a criminal. One car ride exemplified this relationship. “We were all little kids on a long family car ride to Wisconsin… In the distance we see a McDonald’s and get so excited we started chanting ‘McDonald’s.’ My dad pulled into the drive-thru and we started cheering, then my dad ordered one black coffee for himself and kept driving. As mad as that made me as a little kid, that was the funniest thing I have seen in my entire life,” Mulaney said. One of Mulaney’s last narratives was about his parents’ college experience: Both went to college with Bill Clinton, but his mother liked Clinton much more than his father. One night Clinton had even walked Mulaney’s mom back to her dorm from the library. When Clinton announced his candidacy, he held an alumni reception at his alma mater and Mulaney’s parents were invited. Mulaney’s mother took him to the event since his father did not want to go and did not think Clinton would remember them. Not only did Clinton remember Mulaney’s mother’s name but he also talked with Mulaney, prompting him to come home and tell his father he would be a democrat. Years later, when the Lewinsky scandal broke, Mulaney’s father woke him with the front-page news, only to go into his law office and discover that his law firm was called upon to defend Clinton. Mulaney said he became a comedian in part because he felt that no one cared to listen to him growing up. “Sometimes people would say, ‘What do you think you’re doing?’ but that just meant stop. 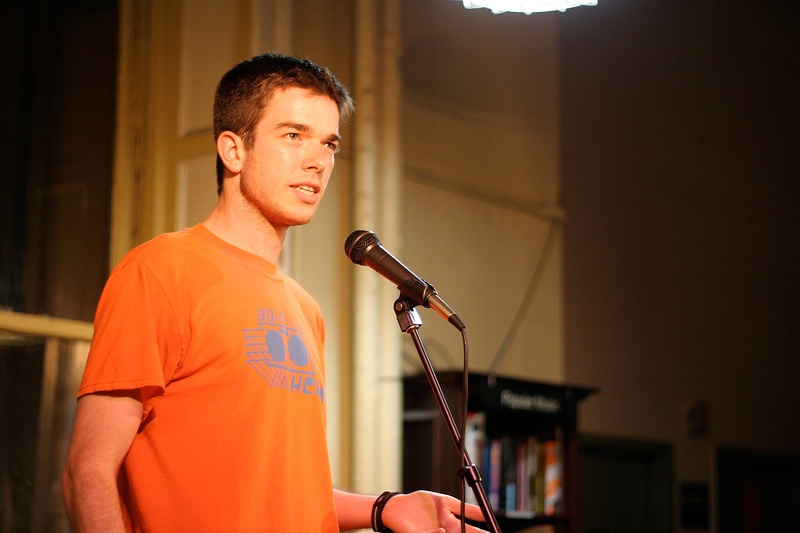 They didn’t actually want to know my thought process,” Mulaney said. He wrote for SNL for six seasons, co-creating the infamous Stefon character with actor Bill Hader and occasionally appearing on the recurring “Weekend Update” segment.